Falling Free, written by Lois McMaster Bujold, a New York Times best seller, was the winner of the Nebula Award for Best Novel. It takes place onboard an orbital transfer space station around ‘the shining rim of the planet Rodeo’. The main character and later hero, Leo Graf, has been brought to the space station to teach a group of genetically engineered humans welding and general construction techniques. These humanoids, called quaddies (which I won’t go into so as not to spoil the story), had been developed to be perfectly adapted to work and live in the weightlessness of space. In theory, the GalacTech corporation (who developed the quaddies) thought this would be a cost-effective alternative to dealing with the long-term and costly effects of space on their normal human workforce. On a personal side note, having worked with several people who have actually been in space, I can say anecdotally that just about all of Bujold’s descriptions of how people move and act in space and its deleterious effects, were amazingly accurate. This was particularly surprising considering it was written in 1988 when NASA was still quite young in terms of understanding the effects of space itself. Graf’s mission changed from teaching these ‘products of science’ to be the next generation of superior space workers, to being the savior of these kind and extremely naive ‘quaddie children’. He was made aware of the corporation’s desire to dispose of the quaddies—albeit different from you and I, but people none the less—once gravity-plating technology had been reported to soon be available. Although expected to be expensive, the new gravity plating would still be more cost effective to use with ‘normal’ humans rather than taking care of the thousands of quaddie workers they were currently raising and would take care of for their natural life spans. While it was not clear if it was the author’s intention to make a social statement regarding unregulated corporations, it is my opinion that it’s a good example of what could happen if corporations are left to themselves without regulation and how they can conveniently rid themselves of ethical liability and responsibilities via mountains of bureaucratic paperwork and ambiguous legalese. Bujold provided a reasonable layout—from GalacTech’s position—of a very credible ‘disposal plan’ regarding how to take care of the quaddies once and for all and place the overall fate of the engineered workers within the realm of plausible deniability. In reading through the plan, it honestly made my stomach turn at how similar it sounded to any one of many stories that we have heard in the news in recent years. The story is actually a prequel to the Vorkosigan series, it takes place 200 years before the next book, and none of the characters are carried forward into the storyline of the series. It was written later to provide some back story to how the series came about. 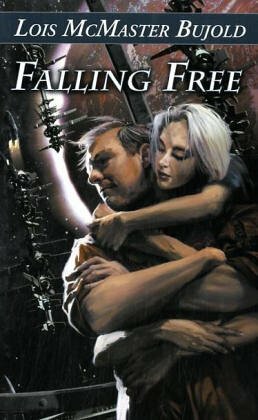 Bujold mentions in her notes that she intended most of the books to be able to stand by themselves in terms of story, plot, and characters, but she felt that Falling Free would add some depth to the overall storyline and add a Genesis-like back story. The characters are well developed, none are overly complex, and they stay fairly constant. The exception is Graf, who has a change of heart in terms of what he will eventually achieve on this work assignment, and decides that he must be the one to stand up for the defenseless. In writer’s terms, this is an example of where the main character’s motivation changes while his character for the most part stays the same. The bad guys are pretty easy to spot and only get less congenial as the story progresses. And while Graf doesn’t always know about it, he does benefit from help given by some characters whose conscience gets the better of them within the antagonist’s camp. While the lack of significant complexity might turn some readers off, I did not find it too distracting, because for me the story was about hanging in there to find out how the quaddies were going to survive when all of the odds were stacked against them. How did they do it? Did they make it? Well, that’s for you to read and find out. Enjoy!